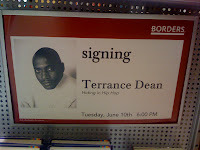 Terrance Dean will be at the Borders in Downtown Crossing tomorrow, June 10th to do a book signing for his book "Hiding in Hip Hop." Can you tell I've been spending a lot of time at the bookstore lately? Heh. Former MTV producer Terrance Dean has written a memoir titled Hiding in Hip-Hop: Confessions of a Down Low Brother in the Entertainment Industry, which will chronicle "the author's life as a closeted homosexual working in the film and music industry and his relationships with other closeted homosexuals—film stars, rap artists, and music producers," according to RadarOnline.com. The book signing will be held at 6pm tomorrow. The book got 4/5 stars on Amazon.com from customer reviews (here). 0 Response to "Terrance Dean Book Signing - 6/10"